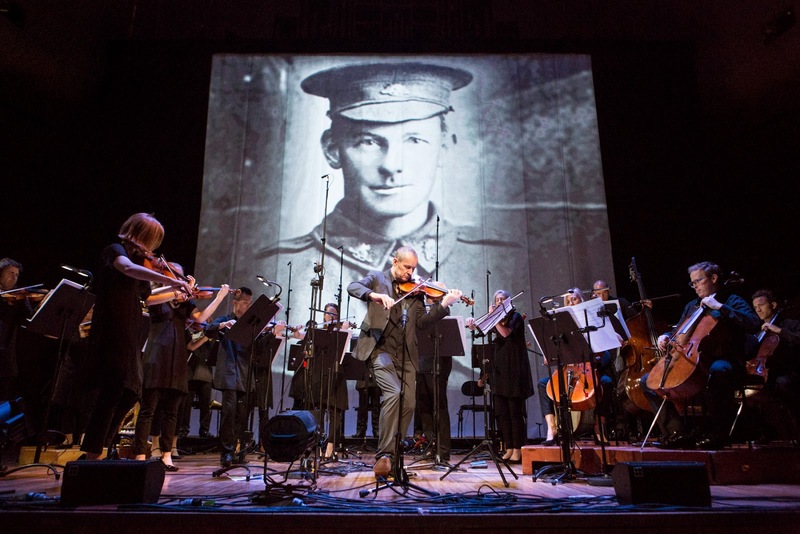 Australian Chamber Orchestra (ACO) presents REFLECTIONS ON GALLIPOLI, at Sydney City Rectal Hall Angel Place. One was brought to deep reflective emotions, that culminated in tears, by a programme of music, classical and folk, with words and images in the Angel Place Recital Hall and, I daresay, one will have to look hard and long for a memorial to the tragic action of Gallipoli - this year, 2015, it's Centenary year of remembrance - that could reach to such heights of integrity, dignity and human feeling and thought, than this concert brought to us by the Australian Chamber Orchestra (ACO), under the musical Direction of Richard Tognetti. Collaborating with Mr Tognetti and his outstanding orchestra, were Nigel Jamieson as Devisor (his own production: GALLIPOLI, for the Sydney Theatre Company, a great piece of theatre, several years ago, now), Sean Bacon as Video Designer, Matt Cox with his sensitive Lighting Design, Directed seamlessly and sensitively by Neil Armfield, guiding marvellously honest and deeply felt performances from actors, Yalin Ozucelik and Nathaniel Dean - both truly outstanding in their expression and finely judged passion and compassion with the language from the observers and participants in the thick of the battle campaign - and, too, Taryn Fiebig, in song. There was no anger, bitterness or political angst expressed in this concert but rather a gentle dwelling on the wasteful carnage of all who fought at Gallipoli, the invaders and the defenders, with a verbal and musical detailing that placed layer upon layer the tragedy of MAN and his primitive practices to contemplate. An active melancholia that transubstantiated into swelling prideful appreciation of the sacrifice exampled there, rose within me. A greater, a more intelligent and moving statement concerning the stupidity of war I have not, personally, had so skilfully articulated, for me before. The music selected was composed by Bela Bartok, Nevit Kodalli, Ralph Vaughan Williams, Frederick Septimus Kelly, Edward Elgar, and two World Premiere's of commissioned works: SOLILOQUY, and OUR SONS, by Carl Vine. Mixed in the program were some folk song, traditional and composed by Muzaffer Sarisozen and Mehves Hanim. The mixture and choice of the score impeccably ordered and created for a smouldering impact of affect. Whilst the actors were supplied with words that exampled the behaviour of men under awful duress with insight and level headed balance. These heroes who shed their blood and lost their lives - you are now lying in the soil of a friendly country. Therefore rest in peace. There is no difference between the Johnnies and Mehmets to us where they lie side by side here in this country of ours ... You, the mothers, who sent their sons from far away countries wipe away your tears. Your sons are now lying in our bosom and are in peace. After having lost their lives on this land they have become our sons as well. This was the inspiration for Carl Vine's, SOLILOQUY (one of the commissioned works) and was the measure of the humanist tone of this concert: REFLECTIONS ON GALLIPOLI. It was a memorable experience, given, exceptionally, by all. The intimacies and transcendent beauty of Vaughan Williams' THE LARK ASCENDING (Composed in 1914, revised in 1920) could not be surpassed in Mr Tognetti's rendering with his orchestra - unforgettable.